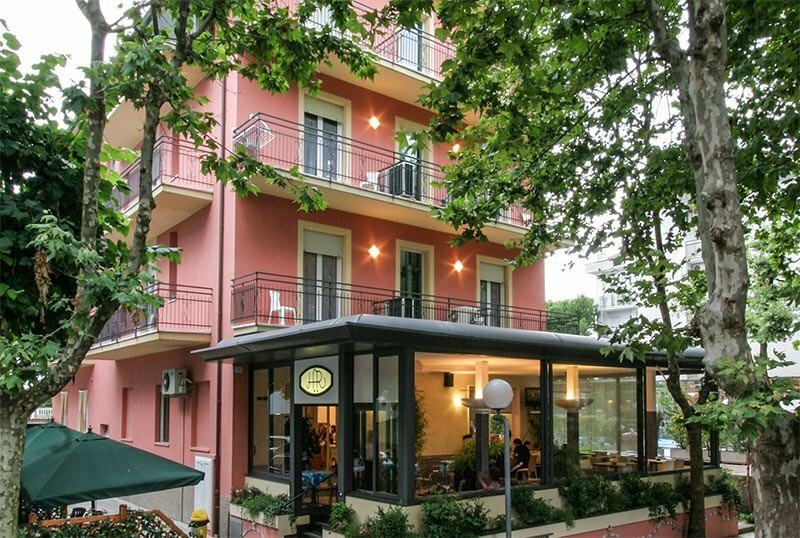 Two stars of family-run Igea Marina, the Hotel Villa Rossi has been recently renovated and has a parking area, a furnished open-air porch, a children's play room with TV / VCR and typical local cuisine. Accept small and medium-sized animals. The hotel is located in central Igea Marina, less than 5 minutes walk from the beach. The rooms, recently renovated, all have private bathroom with shower, hairdryer, complimentary toiletries, safe, satellite TV and digital terrestrial, ceiling fan and air conditioning. On request: rooms with balcony, in-room massages with specialized staff of the Cervia spa. FAMILIES: there are family solutions. Garden, terrace, large open-air porch, free bikes, wind surfing and more, dining room, elevator, rumpus room equipped with games and TV / VCR, laundry service, evening entertainment for all and theme parties, two weekly evenings in dance hall . PARKING: uncovered and free at 200 m, available for all guests. Garage for bicycles. CONVENTIONS: beach, amusement parks, discos, organized excursions. PETS: it accepts pets of small and medium size. LUNCH AND DINNER: inspired by the local gastronomic tradition, the kitchen offers every day 3 menus with choice of meat and fish with vegetables buffet. Water included with meals in all treatments, wine and drinks in all inclusive. In the hotel: indoor and outdoor playground area, strollers, pediatrician, baby sitter, entertainment after dinner (from 8.30pm to 9.30pm), children's disco party once a week. The hotel has an agreement with the Bagno Solaria, with baby club, bocce and beach volleyball courts, children's playground areas, gymnastics, dance and water gym. Prices are per person per day for stays of at least 3 days. Enjoy a peaceful and quiet Easter weekend.